PrivaZer – The Ultimate Privacy Tool? Privacy – real privacy – is something that is hard to come by these days. In our modern times, when everything and anything can have a camera, a memory card, and someone on the other side, you can never be too careful. Downloaded files can contain malware that lie dormant in your systems and strike when they want to. Hidden programs can upload your personal information for the benefit of strangers. Hackers can obtain your private files with one press of a button. Tech savvy people out there can do many things in order to protect their privacy. Some use VPN to hide their activities, others use private servers. Some try simpler tricks (that can also be effective) which include covering your laptop cams with stick-it notes and not uploading important items on cloud storage. But what can you do to get the most digital privacy for your everyday lives? Believe it or not, the best and still most accurate way to protect your privacy is vigilance. An ounce of prevention is better than a pound of cure, or so they say. Cleaning your browsing histories regularly can save you a ton of trouble in the long run. Maintaining your PC drives and checking them for presence of viruses and malware can also do the trick. Regularly checking downloads and their folders also help weed out unwanted files. Another is to double-check emails, passwords, and make sure you are the only one who has access to them. Of course, this can be a complicated routine. Lots of moving parts, lots of things to do. It can be very difficult to remember them all. This can be the case especially for those who do not know where to start, or those who do not have the time. PrivaZer is an all-in-one software you can install on your PC. Think of it as a multi-tool maintenance program that guarantees security to your files. 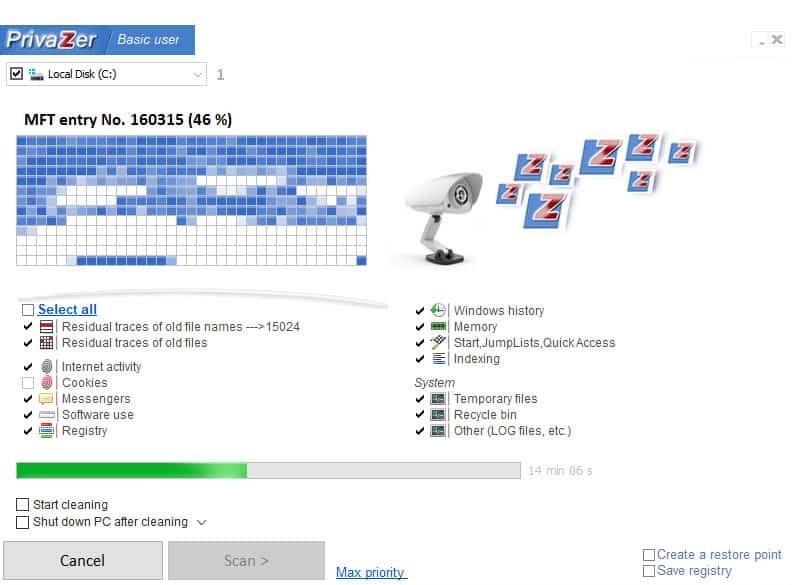 Here, you can monitor your entire PC and clean up every nook and cranny in one click. In its essence, the PrivaZer does everything you need for you. That way, you can be sure that your computer receives proper maintenance inside, while doing none of the annoying countermeasures yourself. No more doubts of malware or viruses hiding in your folders. Your internet browsing history gets removed and stays erased regularly. Browsing online gives you an extra wall of anonymity and protection. Leaving a site gives you an option to show that you were never there to begin with. Temporary files that carry your information will never see the light of day. One click, and you have your privacy guaranteed. Privacy is not the only thing PrivaZer offers. They also clean your folders from unnecessary junk that often causes your PC to slow down to a crawl. Privacy – real privacy – is something that is hard to come by these days. But it is attainable. If you do your due diligence and maintain your PC, you will never have any problems when it comes to data leaks or hacked accounts. Getting the right tools can be the main difference in effective protection. Hope that application will give what real privacy protection system should be doing. Lots of other apps that are still lacking of security and even worthless.